#OpenBadgesHE – reflecting on putting the pieces together. We all know how important it is to plan. After all, fail to plan and you plan to fail! However the #openbadgesHE conference held on March 8th 2016 was a triumph of both planning and serendipity. The best things happen not only when you plan carefully but also when you are flexible and seize the moment! 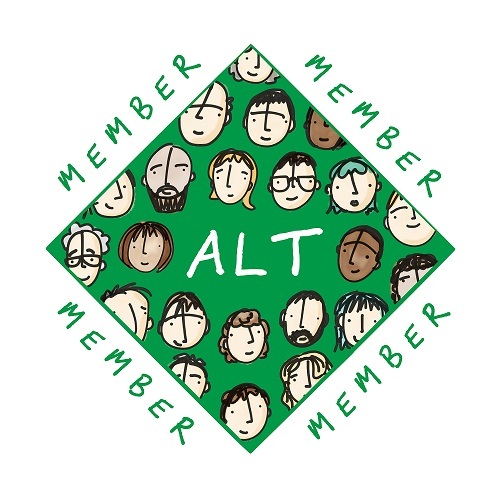 The idea for a conference emerged when Fiona Harvey (University of Southampton) visited the TEL team at the University of Sussex to talk about open badges. 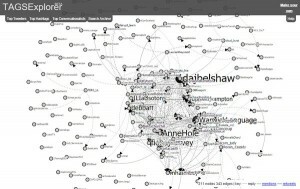 The University of Southampton agreed to host the one-day event and a tweet led to an informal collaboration . Fiona, Anne Hole (University of Sussex), Debbie Baff (Swansea University), Patrina Law (Open University) and myself (University of Warwick) got together through online spaces to plan the conference and review the many offers of papers. The implementation of the physical event was expertly handled by Southampton’s student and staff team. 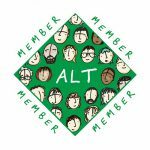 You can get a taste of the buzz and the fun that was had from this storified collection which captures some of the interactions between the 150 delegates and 100 tuning in on livestream – from all over the world. The presentations from the day and further resources are now available on the conference website. With the conference now over, I am reflecting upon my learning. Talk of the use of open badges as a form of micro credential in a wide range of educational contexts has been around for a while, but has not gained much traction in Higher Education. We knew we would need expertise in order to raise awareness of this great idea in the sector. Doug Belshaw and Carla Casilli set the tone at the conference providing an opportunity to learn from the UK and US perspectives. Doug is well known in the UK for his work with Mozilla and his e-book on the Essential Elements of Digital Literacies is a must read! Carla’s input on credentials provided an opportunity to grasp this nettle and provoke a wider discussion. We had a good response to the call for papers for the conference and decided to focus on those who had implemented and evaluated open badges in an H.E. context to engage, address concerns and inspire. Examples came from different contexts including staff development, language learning, employers and student digital champions. Presenters were from Germany, France and beyond, bringing an international dimension to the event. Delegates found it helpful to see how the idea had been applied and many reported having been inspired to try them for themselves. .
As well as live streaming keynotes and some of the other sessions, Periscope was used to share informal video broadcasts, Instagram and Twitter were buzzing with open badges. A Padlet wall displayed the digital posters and could be taken away by scanning a QR code. A media team recorded interviews with participants and organisers. 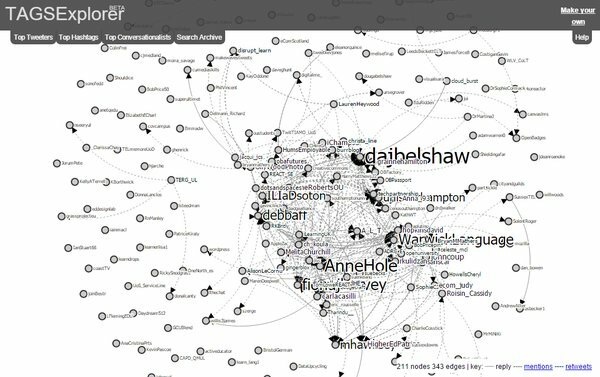 The #openbadgesHE Twitter interactions were visualised for us by Martin Hawksey (ALT) showing how the ripples fanned out from the event and connections were being made. The face to face event facilitated sharing and discussions over a very pleasant array of food and drink shared in social spaces at the venue during the event. 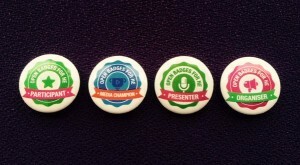 Physical versions of our suite of digital badges for participants, presenters, media champions and organisers were a big hit. Implementation: where do open badges fit in HEIs existing ways of working? 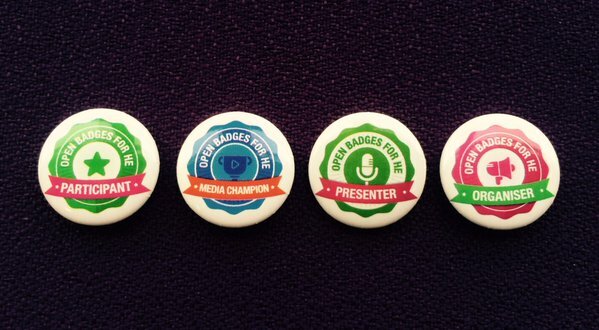 Development: will open badges become a form of currency, recognised by employers? Disruption: how far will open badges disrupt existing ways of recognising achievement?